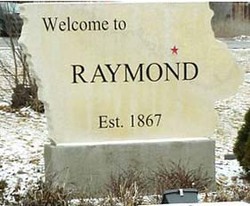 The City of Raymond welcomes you to our website designed to help residents and visitors find information about our town. Raymond is a great place to live and work. We have an elementary school, two churches, two parks, 300 homes, and several businesses. We are located just one mile off Interstate 380 and 7 miles east of Waterloo. 2016 estimated population is 809. The City Council of Raymond, Iowa will meet in regular session on April 15, 2019 at 6:00 p.m. at Raymond City Hall. Approve April 1, 2019 regular meeting minutes. Resolution 1343 authorizing payment of bills and transfers. Accept and place on file the minutes and reports from the following Boards, Departments and Commissions (N/A=Not Available): Clerk/Treasurer Report (March 2019), Receipts (March 19, 2019 – April 15, 2019), Sheriff’s Report (March 2019), Library (N/A). Discuss/Action on burn request from Irv Thome at 6517 Lafayette Rd. Discuss/Action on new 28E Agreement with Waterloo Water Works–Tabled until Council hears back from Waterloo Water Works. Discuss/Action on STPG Application for Lafayette Rd. Discuss/Action on selling Spartan Pro-Tech Sewer cameras. The North Water Main Looping project is set to begin very soon. Graff Construction of Toledo, IA tentatively plans to have crews on site to begin construction the week of September 17th. This project includes the installation of approximately two miles of water main primarily along Conard Rd, allowing for a second connection to Waterloo Water Works system at Elk Run Road and completing an important water main loop for the City of Raymond. Water main installation will take place this Fall, with final restoration and seeding to take place in the Spring. In the coming weeks, you can expect to see underground utility location markings and flags. These markings and flags are used to identify conflicts and warn the Contractor to the presence of underground utilities. Please do not disturb the markings or the flags as they are vital throughout the construction process. Likewise, construction stakes and hubs will be placed to mark out the water main alignment and elevation for the Contractor. Please do not disturb these features. For residents living near the project corridor, please use caution when traveling near the construction zones, as there will be some debris, stockpiles of materials, equipment and/or personnel working at various times of day. One-way traffic will be maintained along Conard Road at all times during construction. We appreciate your cooperation in following signage and alternating traffic during lane closures. Patience is appreciated as Graff Construction, the City of Raymond, and MSA work together for a successful and timely completion of the project. Should you have any questions, comments or concerns, please feel free to contact Jake Huck with MSA or Raymond City Hall. Hawkeye Valley Area Agency on Aging meals are offered on a contribution basis for people over 60 years of age. Actual cost for the meal is $7.26. People under the age of 60 must pay the actual cost. Meals are offered on a contribution basis to those ages 60 and over. Meals are offered at the United Method Church in Raymond at noon on Wednesdays. For more information, to reserve a place or order a meal, call the Senior Center at 319-874-6849. April 10th: Beef Spaghetti Casserole, California Vegetable Blend, Multi Grain Breat, Hot Cinnamen Applesauce, Milk, Margarine.